Yesterday we had the fortunate experience of dining at one of Boston's oldest and finest restaurants. Locke-Ober Cafe' is a true joy. Old world Boston. Your treated like royalty the moment you walk through the door. The restaurant remains as it has for years. Ceiling to floor hand carved mahogany panels and Tiffany style stained glass windows. As you enter rhe restaurant you are faced with a Bronze sculpture called "Glori Victis" by French sculpture Marcus Jean Antonin Mercil, known as "Boston's most famous hat rack"
The most distinguishing caractureistic of the dining room is 7 large silver Tureens with a system of pulleys and wires to lift the lids. Its said the heavy silver lids can be lifted with one finger. They are no longer used. Locke-Ober started as a small "cellar cafe" somewhere around 1870 by a fellow by the name of Louis Philippe Ober. After the "Great Fire" of 1872 the restaurant soon grew into a grander eating establishment at 4 Winter Place where it still is today. Louis Ober sold the Restaurant 25 years later to "Wood and Pollard" a wholesaler of liquor. 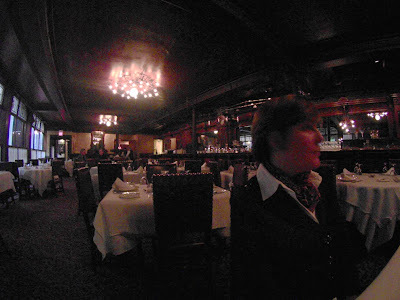 Two years later the owner of a restaurant at 2 Winter Place, next door, Frank Locke bought Ober's Restaurant Parisian. He had run a successful restaurant called "Frank's Wine Room" serving Wine, Liquor and Lunch. The location for the most part was a men's restaurant and closed to women except between the hours of 9:00-11:00 am for viewing only. His ownership of Ober's was short lived. He passed away in April of 1894. Two months after Frank Locke's death the restaurant was again purchased by Wood and Pollard. The two restraunts were combined. The restraunt was then sold to Emil Camis where he combined not only the two menu's, but also the names. Locke-Ober. With the help of J.B.Bailhe' Head chef for "Ober's Restaurant Parisien",they ran a successful restaurant for 40 years. Since then Locke-Ober has been owned by many different folks, All keeping the old world charm that has you feeling you have gone back in time. Lunch was wonderful. We started with their famous Lobster Bisque. Everyone was in heaven with the first spoonful. There wasn't much talking. Perfect. 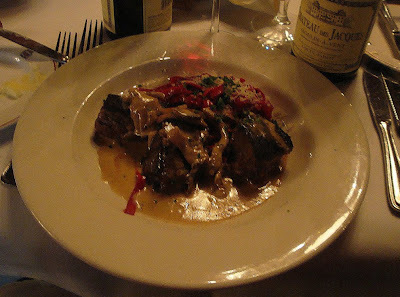 We also went with our waiter Chris's recommendation of the Beef Stroganoff. We were suprized when we were asked how we wanted our beef cooked. The dish came with 3, 2"x 3" pieces of perfectly cooked super tender beef. Mushrooms, cream sauce and red noodles. Out Of This World! Our wine of choice was a Beaujolas, Chateau des Jacques, Moulin-a-Vent. The cold wet and sloppy weather outside was soon forgotten. Red Wine and Beef on a cold wet New England day works miricles! For desert we had their famous Baked Alaska. Barb, the Birthday girl had Indian Pudding with a dallop of whipped cream and a candle. Afterwards, we were given a tour of the upstairs. The JFK room is nice and can be reserved for surprising little money for special occasions. We also got to see where George Bush Senior sat last week. It was not in the JFK room. Our experience at Locke-Ober is one that will not soon be forgotten. We all went out side into the cold rain/snow much happier and wishing dinner had never ended. I'm looking forward to our return. Thank You Locke-Ober and Thank You Chris!